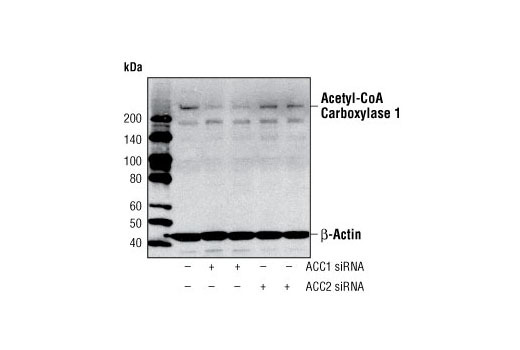 Western blot analysis of extracts from HeLa cells, mock transfected or transfected with either SignalSilence® ACC1 siRNA or SignalSilence® ACC2 siRNA, using Acetyl-CoA Carboxylase 1 Antibody and β-Actin (13E5) Rabbit mAb #4970. Western blot analysis of extracts from various cell types using Acetyl-CoA Carboxylase 1 Antibody. 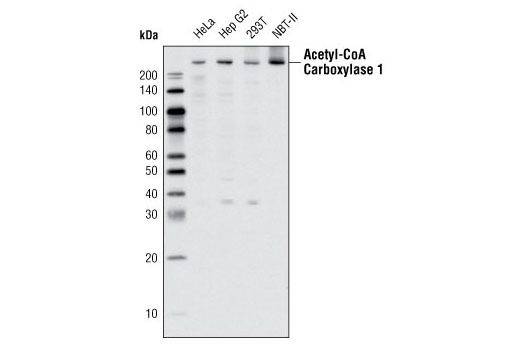 Acetyl-CoA Carboxylase 1 Antibody detects endogenous levels of total acetyl-CoA carboxylase 1 protein and does not cross-react with acetyl-CoA carboxylase 2. Immunofluorescence data indicate that the antibody is more reactive to rodent than human proteins. Polyclonal antibodies are produced by immunizing animals with a synthetic peptide corresponding to the sequence of human acetyl-CoA carboxylase 1 protein. Antibodies are purified by protein A and peptide affinity chromatography.